Carrón: "The Surprise of Christmas: Victory over Fear"
"God’s audacious initiative to Mary also reaches us this Christmas, renewing the announcement of a radical newness." Fr. Julián Carrón's article published in the "Corriere della Sera" on December 23. Elia and Giovanni Gagini's 1457 bas-relief "Adoration of the Magi" is the image that accompanies words by Pope Francis and Father Giussani for this year's Christmas poster. A short review of Damien Chazelle's movie "First Man," an account of Neil Armstrong and the events that brought him to the moon. The film is about "a man who truly seeks the infinite." From David Jones, the poet of the Great War, to Metropolitan Antonij, and ending with “the Grand Inquisitor.” The London Encounter put the spotlight on the paradox of freedom, and on the reason that man can find freedom even in front of death. "Our Hope is in Our Awareness that We are Preferred by the Mystery"
Fr. Julián Carrón to those attending the CL vacation in Honk Kong on November 10-12, 2018. In this Issue of "Traces"
An overview and a short reflection on the contents of the November 2018 issue of Traces, "Made to Know." Watch the full video recording of the 2018 Albacete Lecture featuring Dr. D.C. Schindler. On October 27 in the heart of Manhattan, Crossroad's annual Albacete Lecture on Faith and Culture took place. Its lecturer, Dr. D.C. Schindler, spoke of freedom in the classical tradition and its "metamorphosis since the advent of modernity." During the 2018 Festival of Friendship, AVSI-USA discussed moving from how we face immigration in the abstract to how we face immigrants--telling real stories of real people. Notes from a dialogue with Julián Carrón and a group of students at the CLU Equipe in Italy on the theme, “By these facts, you will know that I am the Lord.” From the October issue of "Traces." Among those present will be the Grand Mufti of Egypt and the general Bishop of the Coptic Orthodox Church. The Italian delegation will also meet the Grand Imam of al-Azhar and the Coptic pope, Tawadros. “The values that sustained our ability to build together have grown weak. The Church and society have the same problem.” We publish an article by Fr. Julián Carrón published on the Spanish newspaper ABC on October 13, 2018. Fr. Julián Carrón's words at the end of Communion and Liberation's Beginning Day on September 29, 2018. On September 20 and 21, 2018, Kansas CL communities along with the founder of the Well-Read-Mom teamed up with parishes to display an exhibit on Dorothy Day. Paraguay: What Reawakens the Heart? The Spanish edition of "Disarming Beauty" was presented in Asunción by Father Carrón with Estela Ruíz Díaz and Favio Chávez. It was an intense dialogue, with many questions and no shortcuts. Pope Francis: "We Recite the Rosary for the Unity of the Church"
This is a request from the Holy Father for the month of October to ask for the protection of the Church from the Devil "who always aims to divide us from God and among us." Here is the press release from Saturday. The archdiocesan news outlet of Kansas City, "The Leaven," featured the Communion and Liberation Dorothy Day exhibit in an article published on September 14, 2018. 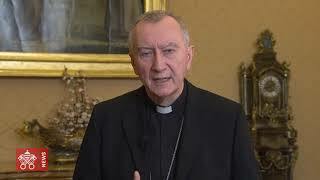 We publish the transcript and video of Cardinal Pietro Parolin explaining the agreement between the Holy See and the People's Republic of China. His Holiness Pope Francis address to Chinese Catholics and the Church on September 26, 2018.